Does your house still have FROZEN fever? Between the boys’ FROZEN birthday party, a FROZEN themed breakfast, and our FROZEN party live tv segment, it’s no secret that we love FROZEN around here! 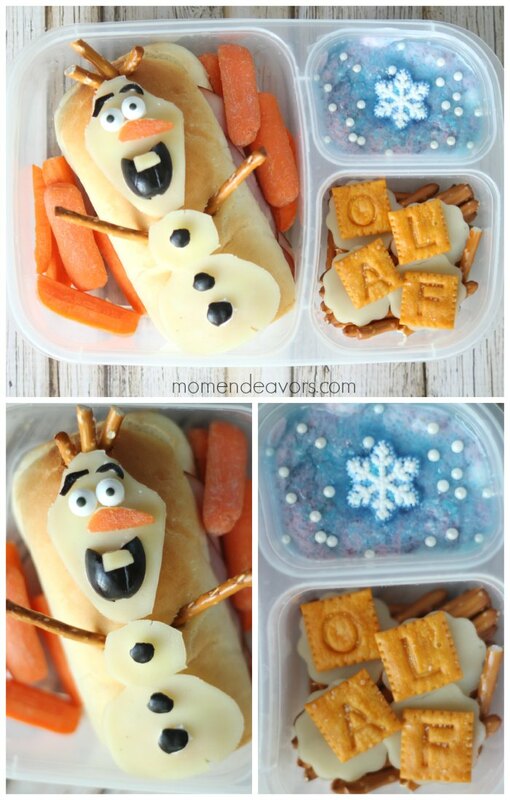 So, I thought it was only fitting that we start the school year off with a fun FROZEN lunch! 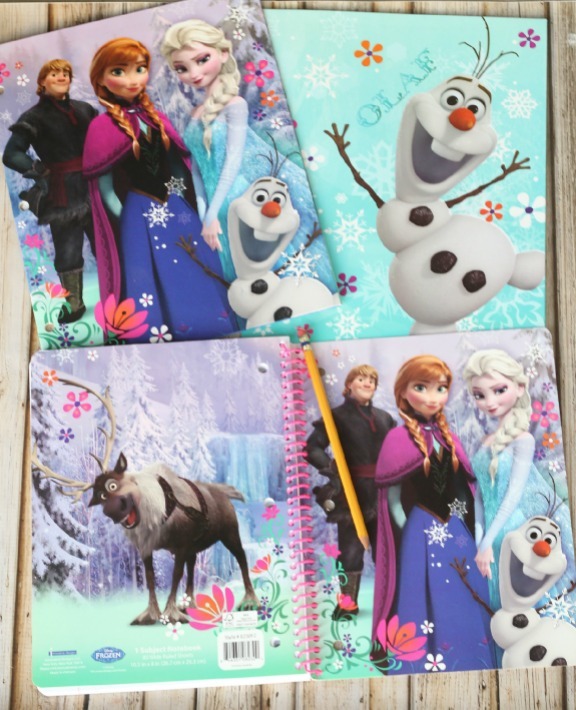 If you have little FROZEN fans, you know how hard it can be to find FROZEN merchandise in the stores – even 8 months after the movie’s release as items just fly off the shelves. 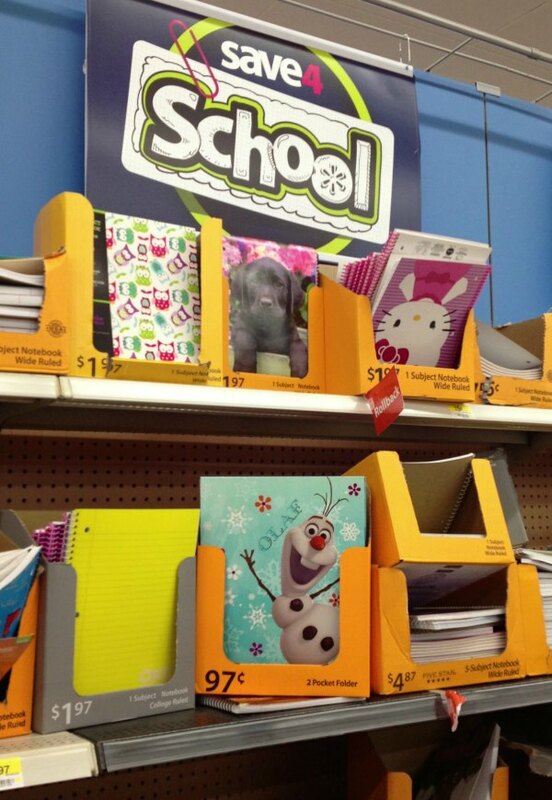 So, while we were out shopping for school supplies at Walmart everyone was excited to spot one box of FROZEN folders and then one lone notebook. It was like magic! We even went back to the aisle about 20 minutes later to get a second Olaf folder and we couldn’t find any more! I love the items we found though! Super cute! In fact, I think I may steal the notebook for myself! 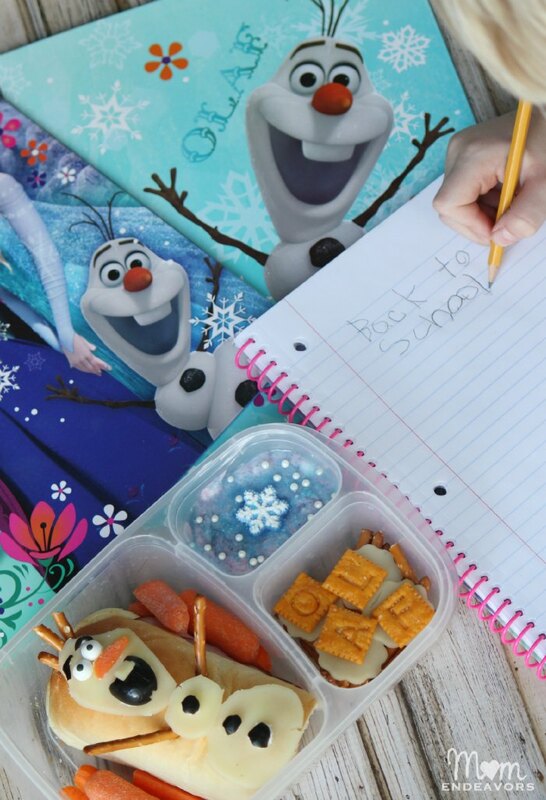 😉 Inspired by our fun FROZEN school supply finds, I thought an Olaf-themed lunch for the first day of school would be great for Big Brother! Olaf and Sven are big favorites around here! But, I decided to focus on Olaf for the lunch. I made Olaf out of provolone cheese laid on top of a sandwich. To get him the right size, I actually printed out one of the Disney Frozen Olaf Printable Valentines pages and cut Olaf out to use as a template. It worked great! Secure the cheese to the top of the sandwich with just a bit of cream cheese and do the same with all the parts. I used cut black olives for his eyebrows, mouth, and coal buttons. Cut a carrot for his nose and a small piece of cheese for his tooth. Stick on candy eyes and pretzel sticks to complete it! I thought carrots and pretzel sticks as sides were fitting then. I also added a few more cut pieces of provolone and “OLAF” spelled out with cheese crackers. For the other side, I included blueberry yogurt topped with a few FROZEN-themed sprinkles & a candy snowflake. Cute, right?! I don’t make elaborate, themed lunches like this every day. But, for Big Brother’s first day back to school, I’m happy to send him with something special! Oh my goodness, that’s just adorable! My girls would LOVE to find that in their lunchboxes. Just pinned it. ahhh! 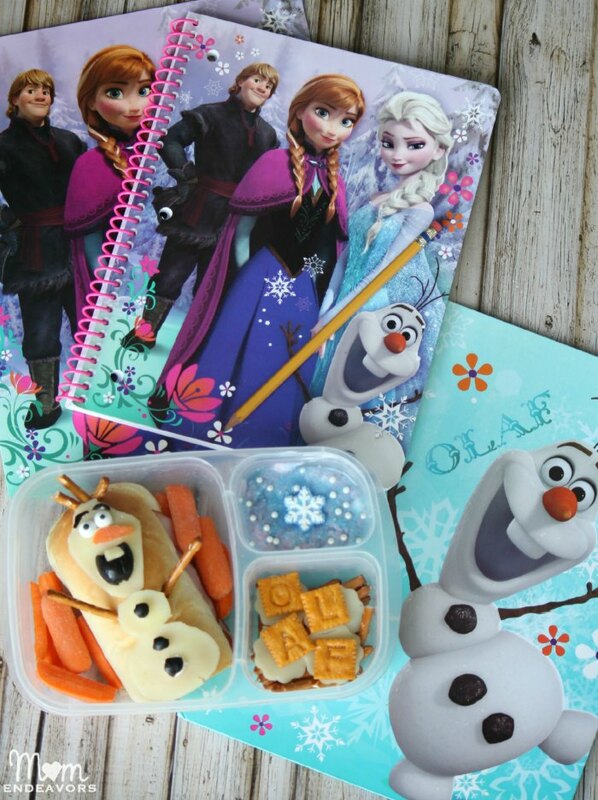 you Olaf lunch is the cutest ever!!! Love love love it… and so great for either gender…. pinned! can’t wait to make this! Oh my goodness! That is the cutest lunch idea ever! My daughter and son would both love that! Where did you find the candy eyes and snowflake? I’ve had them for a while, so I’m not 100% sure. But, you can often find these in the baking section of a lot of stores. Walmart, Target, the craft stores (like Michaels, Hobby Lobby, etc). Hope that helps!! 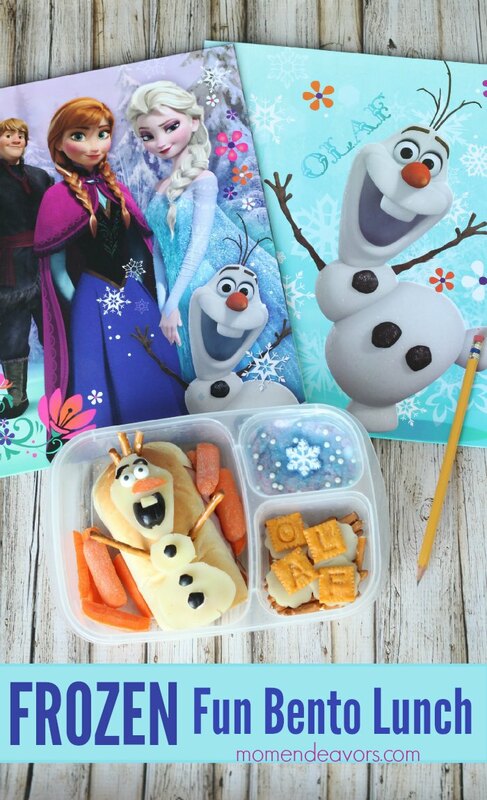 What an adorable Olaf lunch, both my 5 year old & I love it!